Hello, everyone! Welcome to Kawasan Falls! I love outdoor activities but I don’t know who among you here love it too. However, this one feels like a death march to me. I must say this was my first ever enduring hike and the hardest trek I’ve ever done in my entire life. Something that I will never forget so hopefully this will be the first and the last. To me this is a one of a kind adventure and probably not too many people can do this. So if you have ever done this, kudos to yourself. For those who want to have an idea what traverse means and its precautions, here’s some info for you. Traverse means to pass across mountain barangays. Yes, I am talking about “mountains”. You go sideways along those extended mountains. 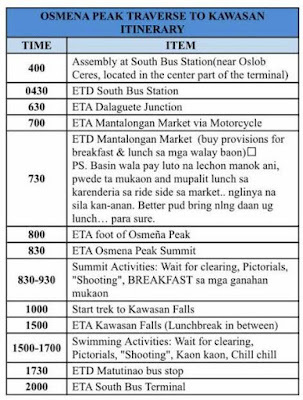 So from the south-eastern part of Dalaguete where Osmeña Peak is, we will traverse to Kawasan Falls in Badian which is in the south-western portion of Cebu. Below is a map with its estimated time if you go on trekking. But once again, it depends on how fast you hike or how many cut-offs you take to catch your breath before you start walking again until you reach your destination. So this is going to be pretty much exciting. On March 14, 2015, the CCF church held a summit activity. In my previous blog, Trekking to Osmeña Peak, we hiked and reached the Osmeña Peak around 9:00 o’clock in the morning for almost two (2) hours already. Although it was not mandatory, however, everyone was encouraged to proceed to the next plan which is traversing to Kawasan Falls in Badian. I had a second thought about it due to health reason but on my own accord, I join the team instead. I am thinking I may not be doing this again in my life once I can get through this, so I give it a go and should enjoy the time instead. Safety comes first and if anyone is planning to traverse to Kawasan Falls from Osmeña peak, I would suggest you assess yourself first whether you can manage the leg-breaking hike. In my case, my sister was with me to look after me and can give me a hand when needed. I was fortunate for we have a tour guide who also offer to carry my bag since he is used doing a lot of hiking and that made my journey more convenient. 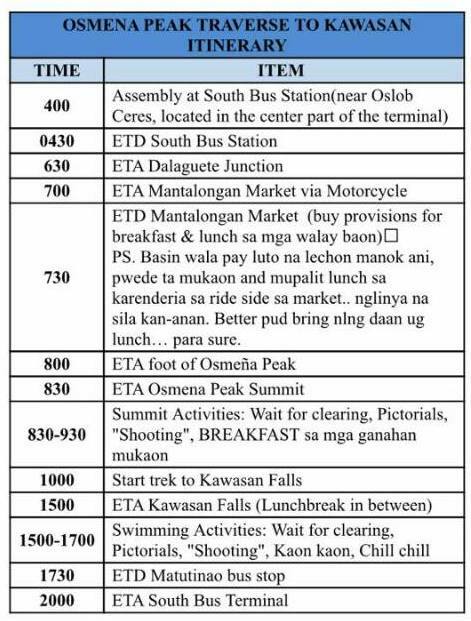 This was our whole itinerary. Some words in our itinerary were written in our vernacular language. It was around 10:00 in the morning when we went down from the peak which was at the back of that puffy mountain behind us. We began walking going up into that other road on this picture. We had crossed the other road now which was the starting point of our hike heading to Kawasan Falls in Badian and this was where the long journey began. Since I had mentioned in my other post that we were divided into three groups, this was our other group in this photo. Looks like we still have energy here as we started to traverse, soon enough some legs here will surely be starting shaken. On our way, I saw some vegetables planted everywhere in those mountains. There were green onion leaves, chillis, cabbage, bell peppers, carrots and a lot more. Evidently, the soil here is rich in minerals to sustain the vegetation. Who wants to ring a green bell pepper in the middle of the heat! Honestly, I started feeling the heat of the sun on my skin as we continued walking on our way. It’s time to feed the tummy and we found a spring in one of the mountains there so we called out for a lunch break. My bag was quite heavy because I had a packed lunch in it and a couple of bottled waters apart from other clothes in there for the two of us (my sister). I would suggest you bring water and heavy meal with you to replenish the energy you’ve lost from the long walk. This was our group picture after we’ve taken our lunch. I cooked our foods for me and my sister the night before the trip. We had “Chicken Adobo”,”Bam-i” and of course never forget the rice. I also had some biscuits and crisps in my bag. Obviously, I don’t like me and my sister run out of food, eh . This spring cooled the surroundings making the place conducive for relaxing which helps us gain our strength again before we continue on our journey. Now I don’t feel like walking anymore because my legs were now shouting for pain but the show must go on unless I want to stay in that forest. So c’mon, break a leg! Now that everyone had relaxed and everybody’s tummy was fully fed, we now have the energy to get back on track. It’s time to get back on our feet and start walking again. Of course, it is always good to have a group picture before heading back to the way and continue the trekking. This experience taught me a lesson that sometimes you can see yourself from other people as a reflection of who you are even to strangers. The other one is, sometimes we need to come out from our comfort zone and try new things, you’ll never know what lies ahead. My camera did not missed this lovely flower that I found in the forest. This was the group where I was in and I think we were about 10 people in each group as far as I can remember. We’re still very far from our destination and in this situation, I am already tired. The good thing about walking with a group especially when you know the people you’re with is the talking. Talking and laughing with them while walking does help a lot at this time as it diverts your attention from your jaded legs and beaten feet. See that red arrow down right there? That is the truth and that truth hurts knowing that our destination is still so very far! “Over there! at the back of that mountain” says the tour guide . I feel like crying after hearing it. I don’t even know if how many mountains we still have to count for us to get there. We have been walking for more than 4 hours now and I’ve now become stale. After the tour guide pointed that mountain and told us that we still have to cross that one, I get jelly knees because we’re still so far from there. I don’t know if I still have energy left so my sister and I had rested under the shade of this coconut tree tries catching our breath. Indeed, what a challenge to my endurance and agility. Mind you, we’ve taken loads of short breaks every now and then but this was the second long break we took prior the first one and lunch break was not included. In another mountain, we found a chapel where people are selling coconut fruit. To quench the thirst, the team decided again to take a break as we were too thirsty and so tired. Below is my friend Tatal, obviously so exhausted. I need to stretch my leg and catch some breath. All throughout our journey, I’ve only seen mountains and trees and after another long walk, we’re down to this place where few families residing here. Here we go again, taking our break and this time we found a decent place to rest where there was a great shade, a coconut fruit for sale and at least some of our mates had found. Here we were taking our break and this time we found a decent place to rest where there was a wonderful shade, a coconut fruit for sale and at least some of our mates had found favor with the people here for letting us use their toilet. I bought coconut juice as I was in dire need of water as well. Ah! the coconut juice was so refreshing. Sitting on this bamboo bed was a great relief to our bodies plus the fresh air around us. Seems like we have rested well here. The trekking was totally a great adventure never mind how exhausted we were at that time, the fact that we’re having a great time with each other was worth enduring.